This was once considered the most important school for African American students in Wake County. Educator Allen Young began building the campus in the East End neighborhood in 1905, and it remained a vital part of the community until 1957. Meeting at the new museum annex, the Wake Forest Historical Society sponsored a forum on the history of the school with a focus on the last remaining building linked to its campus, the Ailey Young House. Historian Ruth Little researched the house, and the town has successfully mothballed it for stability. 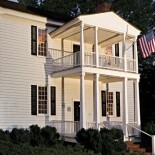 Constructed shortly after the Civil War to house freed slaves, it is considered the likely birthplace of Allen Young and is the only known remaining “Freedom House” in Wake County. These photographs of the Normal and Industrial School come from the North Carolina State Archives. Efforts to fully preserve and reconstruct the Ailey Young House continue. This entry was posted on July 21, 2013 by wakeforestmuseum in East End and tagged Allen Young, East End, Normal and Industrial School, Wake Forest.